"Diamond Comics Digest" featured different comics in each issue. About 1990 (?) the series split in several sub-series as: The Phantom, Mandrake, and on. The sub-series have a double numbering. First, a sequential numbering for the digest series, given in roman numerals. Then, a separate sequential numbering for each comic in regular numbers. On top of that, the digest numbering was different for each language version. 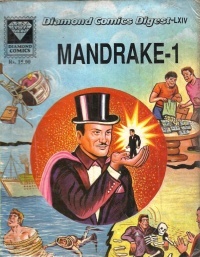 "Diamond Comics Digest - Mandrake" were published in both English and Hindi versiones, in pocket book format and printed in color. From issue #1 to #16, all were digests (68-116 pgs) and published bi-monthly (actually #3-16 were bi-monthly for sure with #3 released on Nov'91. So it's safe to assume that the first 2 issues were also bi-monthly and the release month of #1 was probably Jul'91). After the 16th issue, publisher converted the series in regular forms (36-44 p) and hence from #17 (Mar'94) to #48, all were regular issues and published monthly. From #49 DC-M revert back to it's original digest format and from #49 to #73 (Nov'98), all were monthly digests. Most (if not all) issues were reprinted in new editions over and over again, sometimes with new cover art. Without any numbering some of the covers and stories from the regular series are to find as giveaway's. The last Mandrake issue with new contents was probably published in the year 2000. In 1997 "Excelsia Foods Ltd" marketed Creamwich, a wafer-based biscuits priced at Rs 2 (10-gm) and Rs 14 (70-gm). The Creamwich 70 gm had a free "Diamond Comics", at least two of them with Mandrake. The covers and stories were taken from the previous issues of "Diamond Comics Digest", independent of how the original issues were printed. In 1998 (?) Luxor had a free "Diamond Comics Presents" in their sets of; Colourmate 24 pcs, Colourmate 36 pcs and Colour Sketch Pen Set 12 pcs. The covers and stories were taken from the previous issues of "Diamond Comics Digest", independent of how the original issues were printed. The issues with Colourmate 24 and 36 pcs have a price tag on the covers, so it is possible that one could order single issues (without buying many Colormate's) to collect the entire giveaway series. Some issues of "Comic World" had a "Diamond Comics Digest" Free with this issue of Comic World. Although the giveaway issues have the same cover the "Diamond Comics Digest" inside varies, such as: Mandrake #71 or other characters. The cover has a price tag. Although the giveaway issues have the same cover the "Diamond Comics Digest" inside varies. The cover has a price tag. Although the giveaway issues have the same cover the "Diamond Comics Digest" inside varies. The covers has a price tag. This page was last edited on 28 July 2017, at 09:25.